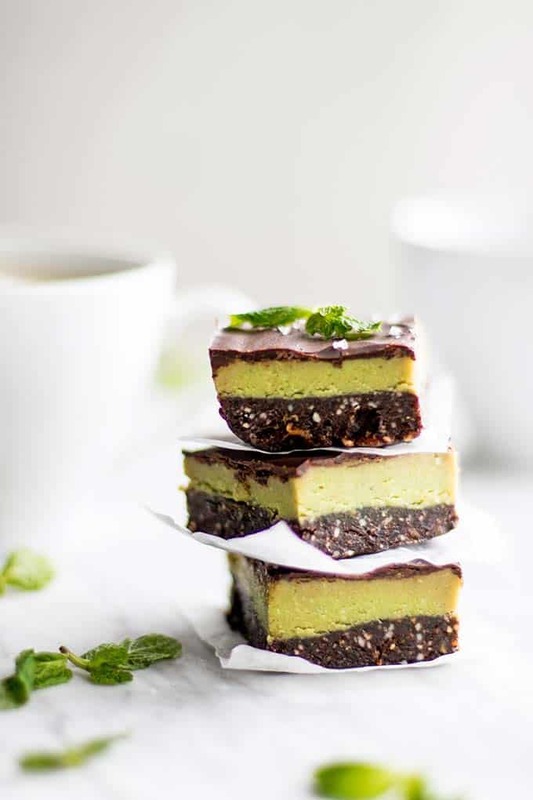 These healthier Raw Peppermint Vegan Brownies are made with nutrient dense ingredients and have rich chocolate and peppermint flavors. If you’re looking for a delicious treat to make this summer, these no bake brownies are just the thing! I fell in love with the simplicity of no bake desserts years ago. Most no bake dessert recipes start with sweet dates, nuts, and sometimes whole grains, like oatmeal. Add some cocoa powder, sea salt, and vanilla, and it’s surprising how brownie-like it becomes in texture and flavor! I kept these bars fairly simple. When you’re cooking or baking in the summer, you don’t want it to take a long time! You want to make something delicious that it’s easy to keep stocked in your fridge/freezer to snack on when you come in from a long day of playing in the sun. Although I love to cook, I cook a lot less often and a lot differently during the warmer months. 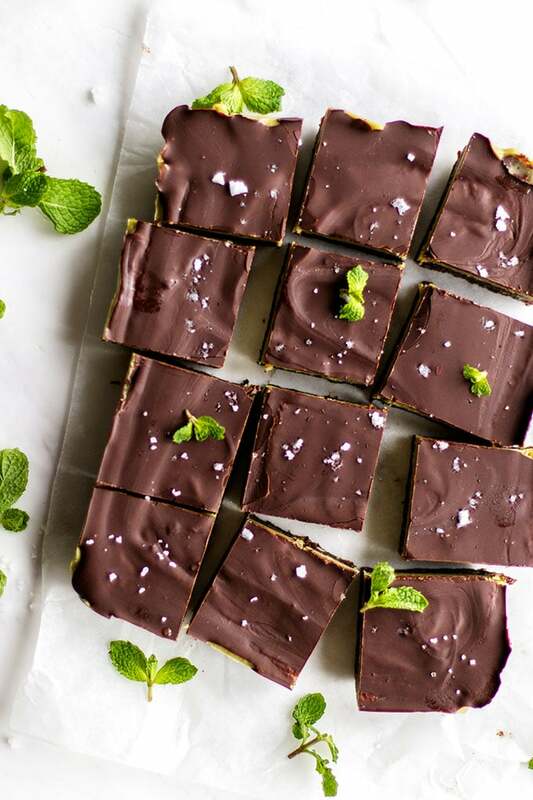 These Raw Peppermint Vegan Brownies look really special (correction: are very special), but are one of those magical recipes that takes just a few high quality ingredients and a few minutes out of your day to pull together. #alwayschocolate, right? To top these babies off (and give that that satisfying chocolate crunch on top), I just melted some Enjoy Life dark chocolate morsels. Love these because they are only 2 ingredients — good for anyone with allergies, but also just good for anyone who wants to know what’s in their food. I buy these babies in a 5 pound bag off Amazon because buying them by the bag can get a little pricey. They are vegan and paleo, plus allergy friendly, which means you can be assured everyone can enjoy the treats you make. I recently connected with Abby from Abby’s Better. She is young (holy smokes! 18! ), and has gotten so much accomplished and has such a clear vision of her purpose. Her company creates nut butters that are healthier for you — free from all the “junk” often put into our packaged foods. She produces a range of peanut free (yay!) nut butters that are naturally sweetened with honey, dates or strawberries (! ), and then lightly accentuated with vanilla and sea salt. That’s it. No unnecessary oils or preservatives or fillers. Just pure, simple ingredients, like you would use in your own kitchen. I received several of her butters, but the Cashew Coconut was my favorite. I knew immediately it would work perfectly in these brownies, which I had been contemplating how to make for a while. Because of the added coconut, this nut butter becomes very firm and fudge-like when chilled – perfect for creating a peppermint fudge layer on top of a raw brownie! I wanted to keep these brownies pure, and free from unnatural and unnecessary ingredients, so I used spinach to create the green hue in the peppermint brownies. Once you’ve put together your brownie layers, they will need to be chilled prior to slicing. I throw them in the freezer for about 2 hours, and then I know they are well set and will cut into beautiful squares. Quickly, I will stack them in a container and keep them stored in the freezer. This recipe is very rich- you will find yourself only needing small pieces to be satisfied! It’s okay to put these Raw Peppermint Vegan Brownies out to serve, but they will change in texture as they warm up. The coconut oils keep them firm and fudgey when frozen, and they get softer as they warm to room temperature. Make it Paleo: These are easily made paleo by using honey in place of the date syrup in the peppermint layer. These healthier raw vegan brownies have a rich peppermint fudge layer. The perfect treat to make in the summer when you don't want to turn on the oven! These are best served right out of the freezer, to maintain their fudgey texture. 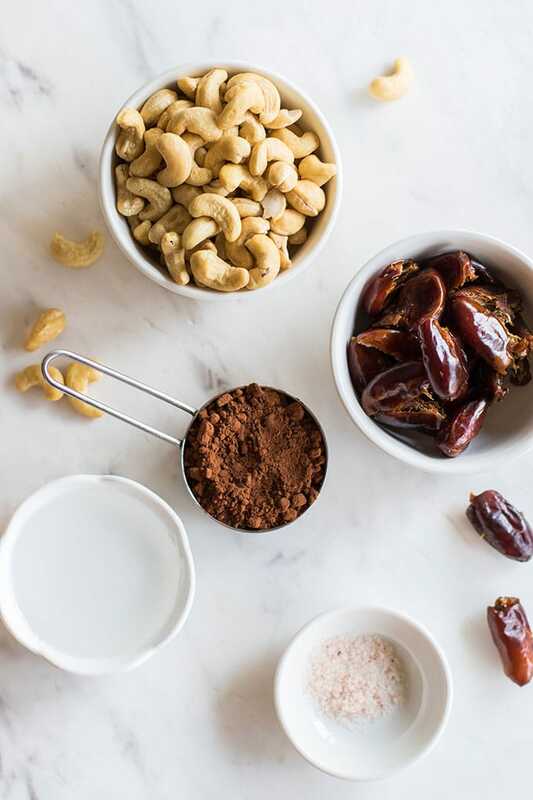 Create the brownie layer by adding the cashews to a food processor bowl, and processing for 1-2 minutes until the cashew are broken up into a course flour. Do not over process to the butter stage. If using soft dates, it's okay to just add them directly. If your dates are old and no longer soft, soak them in hot water for 1-2 minutes, drain well, and then use. Add the dates, cocoa powder, sea salt, vanilla, and coconut oil to the food processor bowl along with the cashew flour. Process until the contents ball up and create a thick brownie batter (will be a large sticky ball of "dough". Press the batter into the bottom of an 8x8 pan. I like to use wet hands to get the dough evenly spread, and then press it down firmly with a pastry roller. To save time, you can mix the peppermint layer in a bowl. If you'd like to use spinach to create a green hue like I did, this must be done in a blender, preferably a high speed blender like a Vitamix. If using spinach, add the spinach, coconut oil, and 1/4 cup of the cashew-coconut butter to a blender. Process until the spinach is fully broken up. Do not use too much spinach or the green color will get dark and too earthy. 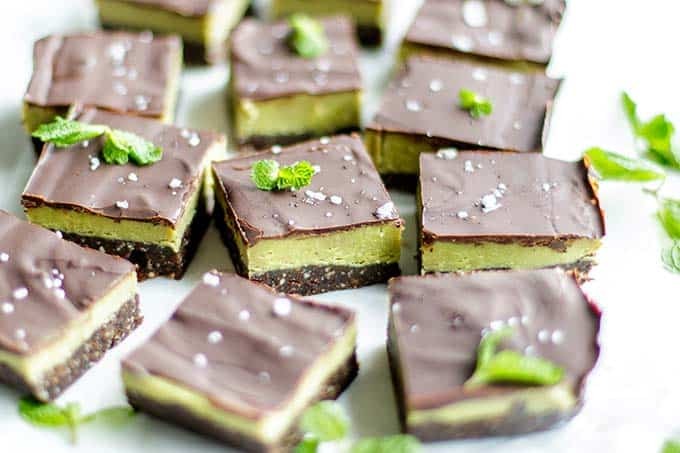 You can also use a bowl and simply mix the peppermint layer together with a spoon -- and if you have a natural green food coloring, you can use that instead. Add the peppermint layer to the pan on top of the brownie layer, and spread evenly. 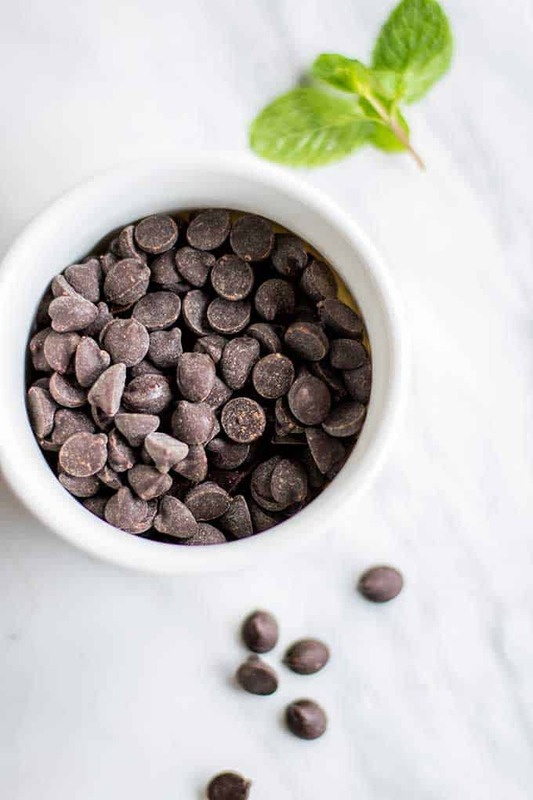 Melt the dark chocolate chips, or use a 85% dark chocolate bar. Drizzle the chocolate on top of the peppermint layer, and then spread out thinly. Garnish with coarse sea salt if desired. Cocoa nibs are also a great crunchy topping. Set the bars by placing in the freezer for about 2 hours prior to slicing. Store in the refrigerator or freezer for best results. These soften quickly when left at room temperature. The fudge-like texture is from the chilled coconut oil. *In place of the Cashew coconut butter, you can sub cashew butter, or use a combination of 1/2 cup cashew butter and 1/4 cup coconut butter. **Peppermint extracts can vary greatly in strength. Be sure to start off small and add more to taste. 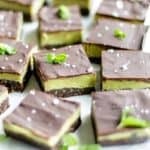 This Raw Peppermint Vegan Brownies post may contain affiliate links, meaning if you make a purchase, I will receive part of the sale as a comission. This helps me continue to bring you lots of fresh and inspired recipes! Mint and chocolate are one of my fav combinations! I love that you've made these so healthy!! These are sure to be a favorite. 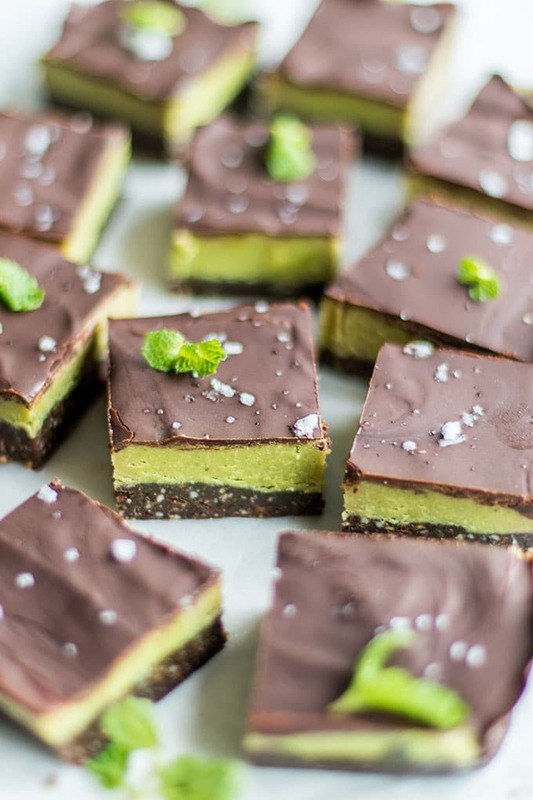 Can’t go wrong with mint and chocolate.